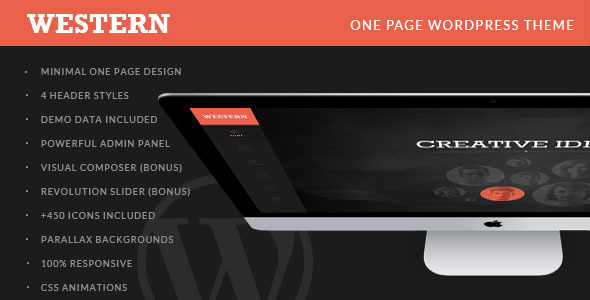 Western – is Minimal One Page WordPress Theme. It is built with Bootstrap 3 and includes lots of awesome features. It includes Premium Visual Composer page builder and Premium Revolution Slider. It is well documented and has 4 different header styles which you can choose easily from powerful admin panel. It has 2 different blog layout options, portfolio pages with multiple thumbnails, testimonials, client slider and much more features. Great deal to buy for creative business agency, personal and portfolio websites.